What does Authentication Manager so special? Controlled user authorization and access are of vital importance when considering the economics and operation of digital multifunctional systems. In some cases, it can make sense to restrict the use of colour or limit certain functions to selected users or workgroups. Authentication Manager, the central server software, allows you to authorise specific and detailed user rights for selected ineos on the network in just one step. From then on, any user logging into a specific system requires either a PIN, ID via the finger vein scanner or a valid chip card. Input data is then compared with the predefined authentication data on the server. With the “Card Self-Registration” it is possible to easily integrate new users in an existing card-infrastructure without any additional work for the IT-Administration. Three security levels control the card disposition and keep new registrations transparent for the Administration. New users and group structures will be completely and automatically synchronised with Windows centralised directory service Active Directory in order to avoid the necessity of double permissions and to enhance a consistent user management. So-called “public users” with no specific authorisation can be given standard system rights such as access to copy functions. In addition, or as an alternative to individual access, accounts can be configured giving access to entire departments and project groups. Authentication Manager reduces your IT administrator’s workload by giving users and accounts one-step access to the digital systems. 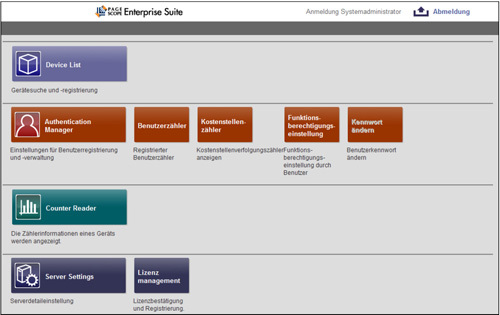 What does Authentication Manager offer you? > Variable analysis options are available for both users and accounts in combination with the optional Account Manager, an additional Enterprise Suite module. Authentication Manager is ideal for use in costconscious environments, such as companies with medium to large sized workgroups, as well as other organisation such as public authorities, schools and institutions. Multifunctional systems are usually available to a large number of employees for unrestricted use and as a result, there is little control over cost and data transfer. Specific security sensitive features such as Scan-to-Email should not be made available for all users. Only controlled access to system functionality can guarantee data and cost security. 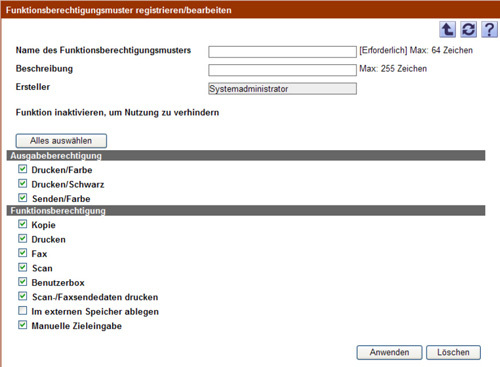 Authentication Manager gives you the possibility to choose who can, or cannot access the system and to what extent. Individual user rights can be restricted and unauthorised access to the system denied. Central administration of all integrated systems reinforces a company’s security levels and help to prevent data leaving the company unnoticed.